Dewey. Bellow. Strauss. Friedman. The University of Chicago has been the home of some of the most important thinkers of the modern age. But perhaps no name has been spoken with more respect than Turabian. The dissertation secretary at Chicago for decades, Kate Turabian literally wrote the book on the successful completion and submission of the student paper. Her Manual for Writers of Research Papers, Theses, and Dissertations, created from her years of experience with research projects across all fields, has sold more than seven million copies since it was first published in 1937.Now, with this seventh edition, Turabian’s Manual has undergone its most extensive revision, ensuring that it will remain the most valuable handbook for writers at every level—from first-year undergraduates, to dissertation writers apprehensively submitting final manuscripts, to senior scholars who may be old hands at research and writing but less familiar with new media citation styles. Gregory G. Colomb, Joseph M. Williams, and the late Wayne C. Booth—the gifted team behind The Craft of Research—and the University of Chicago Press Editorial Staff combined their wide-ranging expertise to remake this classic resource. They preserve Turabian’s clear and practical advice while fully embracing the new modes of research, writing, and source citation brought about by the age of the Internet.Booth, Colomb, and Williams significantly expand the scope of previous editions by creating a guide, generous in length and tone, to the art of research and writing. Growing out of the authors’ best-selling Craft of Research, this new section provides students with an overview of every step of the research and writing process, from formulating the right questions to reading critically to building arguments and revising drafts. This leads naturally to the second part of the Manual for Writers, which offers an authoritative overview of citation practices in scholarly writing, as well as detailed information on the two main citation styles (“notes-bibliography” and “author-date”). This section has been fully revised to reflect the recommendations of the fifteenth edition of The Chicago Manual of Style and to present an expanded array of source types and updated examples, including guidance on citing electronic sources.The final section of the book treats issues of style—the details that go into making a strong paper. Here writers will find advice on a wide range of topics, including punctuation, table formatting, and use of quotations. The appendix draws together everything writers need to know about formatting research papers, theses, and dissertations and preparing them for submission. This material has been thoroughly vetted by dissertation officials at colleges and universities across the country.This seventh edition of Turabian’s Manual for Writers of Research Papers, Theses, and Dissertations is a classic reference revised for a new age. It is tailored to a new generation of writers using tools its original author could not have imagined—while retaining the clarity and authority that generations of scholars have come to associate with the name Turabian. An edge of your seat, nail biting thriller! As a genealogist researcher, I needed to learn how to source my research citations. Very important if you are writing a genealogy piece! This book taught me how in a clear and uncomplicated style. It is updated and has been a classic source for many a research writer. Full of good sensible advice for the writer. I have used this book as a reference since I was an undergraduate student years ago. It has accompanied me through a senior undergraduate thesis, a masters thesis, and innumerable class papers both great and small. I am a bit ashamed to admit, however, that this is the first time I have read the book through from cover to cover. I wish I had done so much sooner. Reading this book through has been a great opportunity to examine the logic behind the genius of the Chicago/Turabian system up close a I have used this book as a reference since I was an undergraduate student years ago. It has accompanied me through a senior undergraduate thesis, a masters thesis, and innumerable class papers both great and small. I am a bit ashamed to admit, however, that this is the first time I have read the book through from cover to cover. I wish I had done so much sooner. Reading this book through has been a great opportunity to examine the logic behind the genius of the Chicago/Turabian system up close as well as to take a much deeper look at my own writing process and the ways in which it can be improved. I recommend this book for anyone who wants to improve their academic writing and research process. Whether they are just beginning their academic career or have been at it a long time, all are sure to benefit. A very useful guide to research thinking. You don't need to be doing postgraduate studies in order to benefit from this book. It is equally useful to anyone seeking to write an informative and research based articles. However it is a guide, you cant just go on and read it without implementing the ideas in it. I would probably return to it whenever I work on a paper until research methodology is ingrained as a habit. How can you write a review about a book that tells you how to write reviews?Here's my effort:1. It's a fine book.2. It will wear you out.3. It is filled to overflowing with minutia.4. I think my soul is emptier as a result.I also feel an overwhelming urge to now properly cite my source:Turabian, Kate Larimore, Wayne Clayton Booth, Gregory G Colomb, and Joseph M Williams. A Manual for Writers of Research Papers, Theses, and Dissertations: Chicago Style for Students and Researchers. 8th ed. Chicag How can you write a review about a book that tells you how to write reviews?Here's my effort:1. It's a fine book.2. It will wear you out.3. It is filled to overflowing with minutia.4. I think my soul is emptier as a result.I also feel an overwhelming urge to now properly cite my source:Turabian, Kate Larimore, Wayne Clayton Booth, Gregory G Colomb, and Joseph M William‏s. 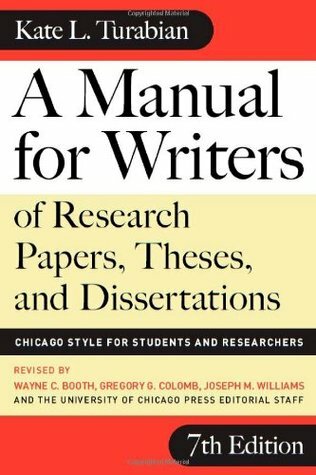 A Manual for Writers of Research Papers, Theses, and Dissertations: Chicago Style for Students and Researchers. 8th ed. Chicago IL. : University of Chicago Press, 2013. Recommended by all my Professors this semester, Turabian's book is a classic for anyone charged with writing essays in Chicago style formatting. Still, locating the text online can be more relevant in cases such as Youtube video citation or blogs which are not covered in this edition. While it seems a bit easier to hunt these instructions down online, the hardcopy is a useful tool to have in your collection. Still crossing my fingers that the academic world would just PICK ONE format and use it Recommended by all my Professors this semester, Turabian's book is a classic for anyone charged with writing essays in Chicago style formatting. Still, locating the text online can be more relevant in cases such as Youtube video citation or blogs which are not covered in this edition. While it seems a bit easier to hunt these instructions down online, the hardcopy is a useful tool to have in your collection. Still crossing my fingers that the academic world would just PICK ONE format and use it universally, already! I loved the reviewer who called this a "nail biting thriller'!! Hilarious! I also agreed with the reviewer who wondered why history, English, and other fields can't all use the same style. I have written papers in 4 different styles! As far as manuals go this one is much like all the others. I can't be very enthusiastic because I dislike the very precise structure of all the styles even while I understand the need for them. This book was one of the required reading materials for my last history course, and I read it as I was working on my research paper. Frankly, I prefer the MLA format, and Turabian can take this pile of you-know-what and jump in a very deep lake with it. Preferably one with a sink hole. To the center of the earth. I hope I never have to use this book again. This is a must read for anyone that wants to do research reports,thesis and dissertations. This book forms the defacto-standard that all the other writers manuals for thesis, research papers and dissertations follow. I used this throughout seminary and found it to be a very useful tool for every paper I wrote. Wish more people would take writing this seriously. This book got me through my PhD dissertation. If you need a "How To Write" this is it. It has solid examples, great trouble shooting methods. I still have it and use it regularly. Read key chapters and use others as a reference, great material!! Excellent tool for writing papers and doing research. I read through the ninth edition of the Turabian manual in order to complete a Graduate Research Seminar for my PhD program, although I have familiarity with Turabian 7 and 8 as well. Overall, the Turabian manual is a solid manual and research paper style for preparing academic papers, and the Turabian manual is a good abridgment of the larger Chicago Manual of Style. Every student should retain the latest editions of Turabian in their personal library, each should read through an edition of Tur I read through the ninth edition of the Turabian manual in order to complete a Graduate Research Seminar for my PhD program, although I have familiarity with Turabian 7 and 8 as well. Overall, the Turabian manual is a solid manual and research paper style for preparing academic papers, and the Turabian manual is a good abridgment of the larger Chicago Manual of Style. Every student should retain the latest editions of Turabian in their personal library, each should read through an edition of Turabian at least once in their academic setting, and those who wish to dive deeper can utilize Chicago's larger manual when needed. While there are a few minor areas I felt Turabian could be a little better on concerning presentation, overall it is the gold standard of academic paper formatting style manuals. This book is absolutely essential to citing sources correctly for Chicago/Turabian style in detail. It is much more valuable than any online version. The first ten chapters are very helpful in effectively making and defending a claim. It is well worth the read, and I wish I had read it my first year of undergrad. I hesitated to even count this as a book I’ve read. I did read it, aside from the strictly reference portions, as part of a graduate course in research methods. That being said, it’s pretty much strictly a reference work. Great reference book. Turabian provides examples of nearly every item you need for research and writing. I wish I could say that I did not have to read this book but it is an excellent reference tool. Required reading for MA in American History. A go-to reference for any student writing research papers, defending theses, and preparing and publishing doctoral dissertations. I will keep it on my shelf forever. I am perpetually reading this, so I figured I might as well record it. Helpful informative book for those who use Chicago style. An excellent reference for all things related to the DETAILS of an academic paper.